Here you find some classic single-board computers, based on legendary CPU's like the Z80 or the 68000. Beside the self-educational purpose (how do I design a memory or I/O control logic, how do I interpret the dynamic bus protocol of the CPU?) I see these projects as personal monuments of milestones in computer history. Not so far in the past the Z80 was a synonym for CP/M and Personal Computers and the 68000 the driving force behind Macintosh computers or the hearths of the legendary Commodore Amiga or the Atari ST. This is my first self-made computer. 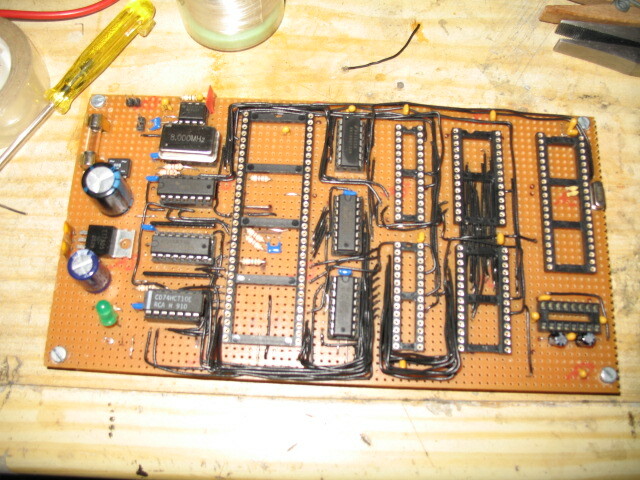 Its a minimal Z80 system consisting of a Z80 CPU clocked by 2.4576 Mhz, 8 kByte ROM, 8 kByte SRAM and a 16C550 UART. 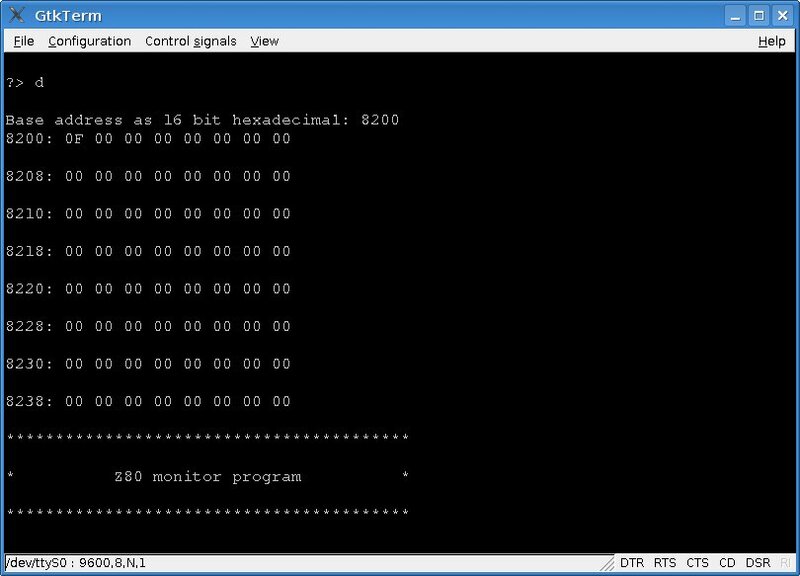 The UART provides an interface for the communication with the computer via a serial link with 9600 baud. There are 3 LED's, one signalling the HALT-signal of the CPU, the others are connected to free-programmable output pins of the UART. The computer is build on a "Euro-Processor" hole-matrix board. For the chasing I used a fully transparent sweatmeat box which gives a complete insight (the purpose!) and doesn't cost a penny. A part of the motivation to build this computer was to build a memorium to an important time of the computer age, the time of 8 bit microcomputers, for whom the Z80 was the "crowning glory", the most perfect example of its kind. Its instruction set was not the product of hardware limitations, the hardware followed a clear spirit. 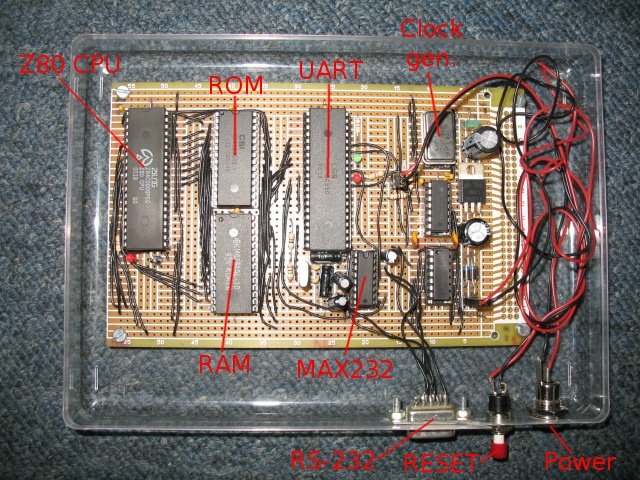 Ahead of its competitors, the Z80 provided 16 Bit Operations, block transfer operations and a sophisticated interrupt system. The power supply consists of a full-wave rectifier followed by a 7805 fixed-voltage regulator. The clock signal is provided by an oscillator module (OSC). The input pins WAIT and BUSRQ have been deactivated by connection to to 2k2 pullup resistors. The NMI input pin is also on H level by a pullup resistor but can set to active L by a jumper bridge. 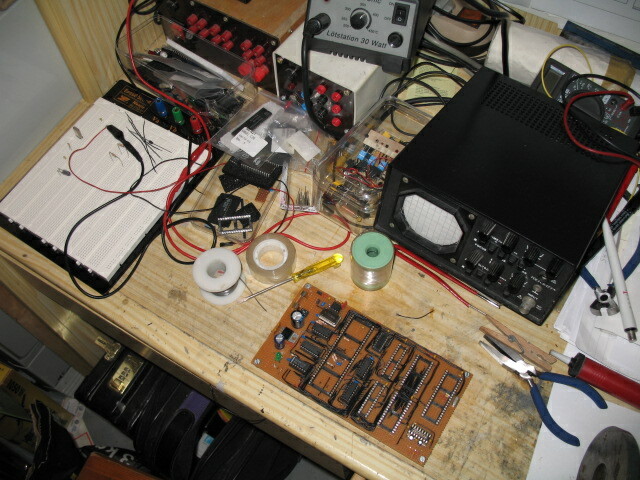 The reset circuit (drawed below the CPU) consists of an RC-lowpass an two cascaded 71HCT14 smith-trigger inverters to produce the H- and L-active reset signal. Notice that the RC combination was not sufficient to produce a power-on-reset. Notice too that the schematic doesn't include the 100n buffer condensators connected directly to the power pins of the IC's. 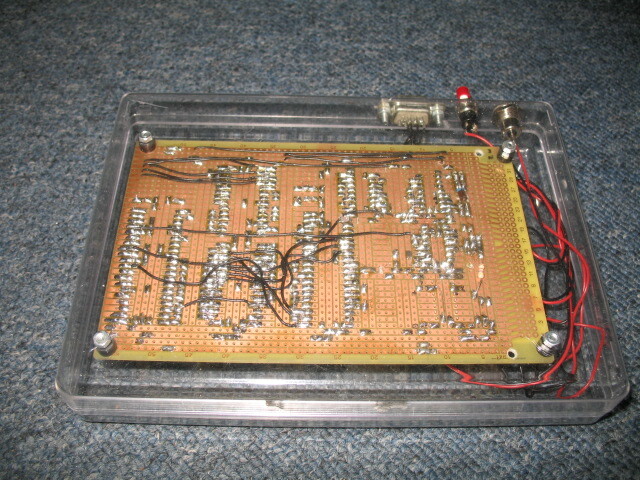 In addition, all unused gate inputs of the TTL chips have been connected to L level to inhibit oscillations. The purpose of the memory control is to generate the chip-select signals for the extern memory chips (8 kByte EEPROM, 8 kByte SRAM) and for the 16C550 UART. A complicated dynamic behavior is not necessary since all memory IC's are fast enough to respond within a bus cycle of the CPU (otherwise the memory control would have to generate WAIT-signals for the CPU). 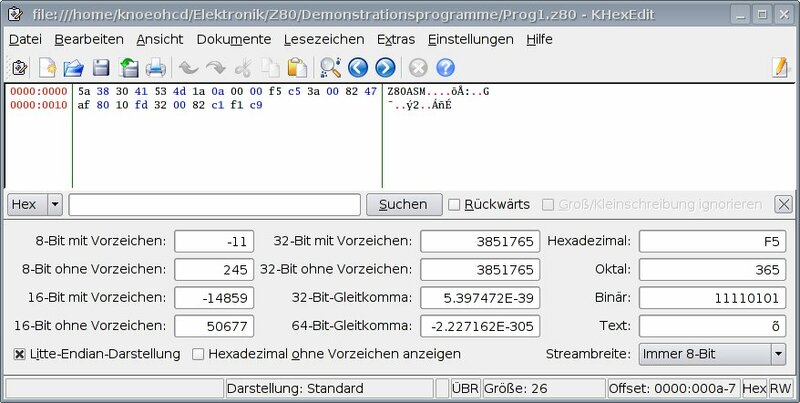 Since the Z80 uses seperate memory spaces for data and I/O I used the following simple address space segmentation: the program/data memory space of 64 kByte is seperated into two halves, the lower half belongs to the 8 kByte EEPROM, the beginning of the upper half to the SRAM. A memory read bus cycle start with an active MEMRQ (L) in combination with a valid address on the bus and the desired direction indicatet by the RD or WR pin. Therefore the chip select signal for the ROM is A15=L AND MEMRQ=L, in short ROMCS = A15 UND MEMRQ, which will be realized by gate U4. For the RAM we have: RAMCS active = L if A15 = H and MEMRQ = L, in short RAMCS = (NOT A15) AND MEMRQ, realized by U3 and U5. For the I/O the main difference is that we use IORQ instead of MEMRQ. Since we have only one I/O chip it would be sufficient to connect IORQ with the chip select of the UART but we have enough gates free. I choosed to set the UART base address to 128, therefore UARTCS = active L if A7=H and IORQ=L, in short UARTCS = (NICHT A7) UND IORQ, realized by U6 und U7. 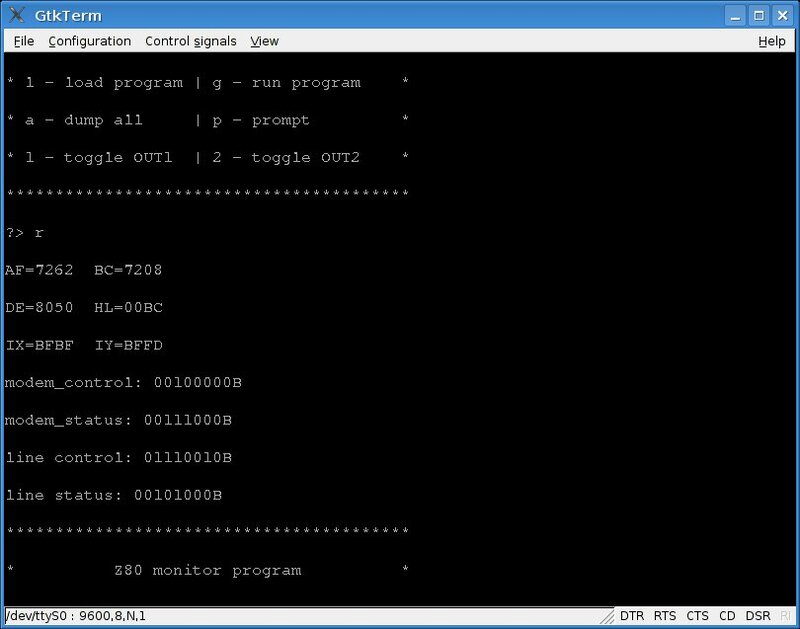 The firmware (or Basic Input Output System, BIOS) has two functions: provide a set of elementary routines (for I/O e.g.) 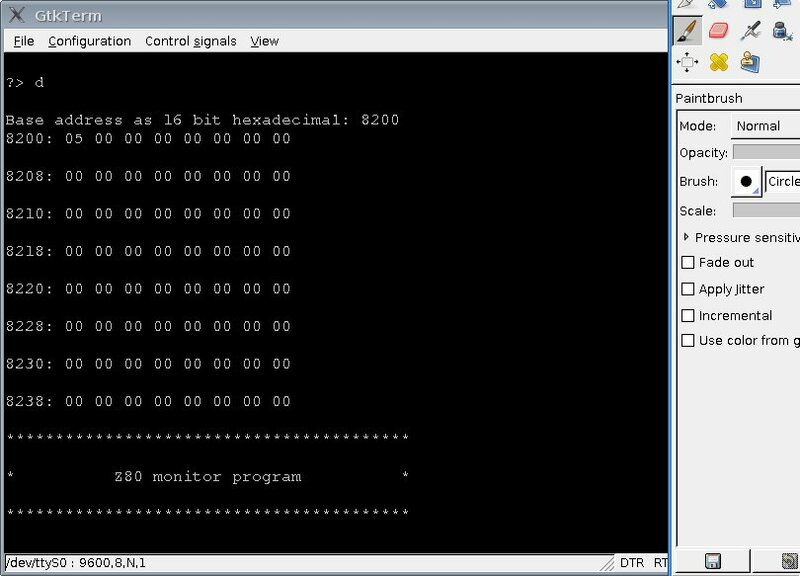 and to provide a monitor tool which allows to see the content of the memory or the registers, switch the LED's, load an execute programs. The assembler source code is available here, the binary here. The following system routines are available: PRINT_CHAR (0xd3) Prints a char. The ASCII code of the char will be expected in the A register. PRINT_STRING (0xb9) Prints a zero-terminated character string which base address is expected in BC. PRINT_HEX (0x144) Prints the content of the HL register as a hexadecimal number. PRINT_BINARY (0x1ba) Prints the content of the A register as a binary number. 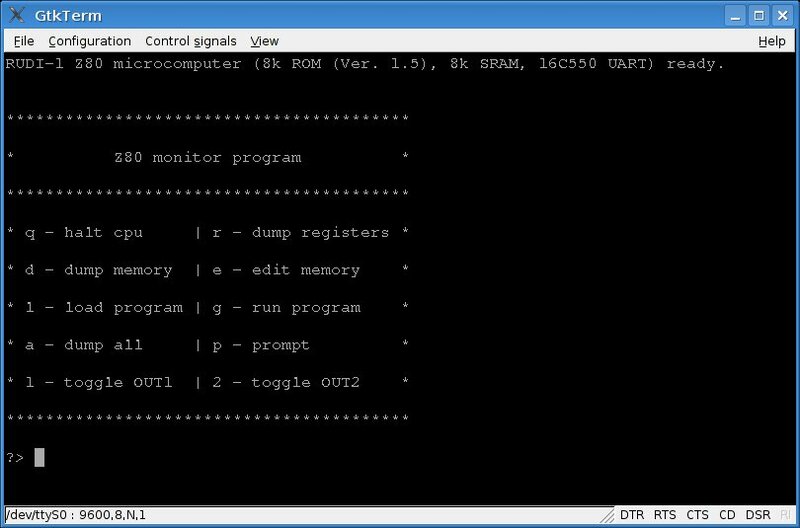 DUMP_MEM2 (0x1cb) Dumps the content of the memory cell indicated by HL as a hex number. Num2Dec (0xfd) Converts the number in HL to a character string containing the decimal code. The base address of the string is expected in DE. 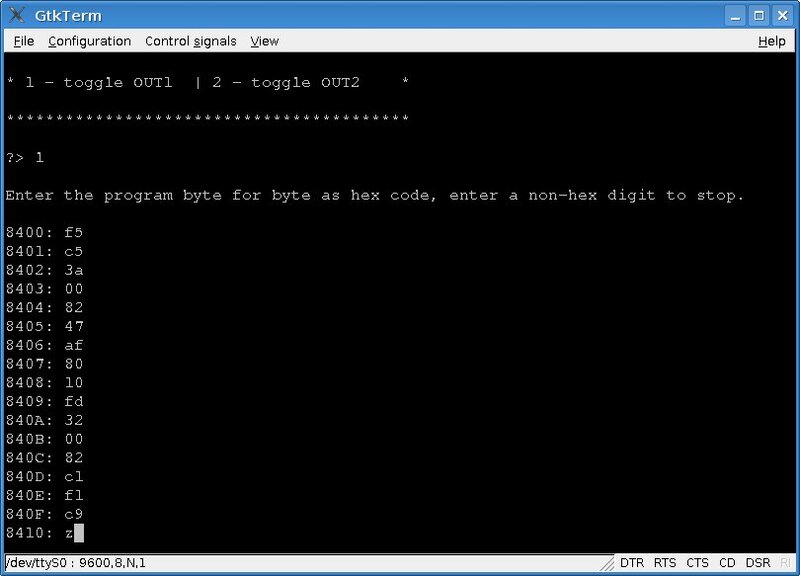 Num2Hex (0x125) Converts the number in HL to a character string containing the hexadecimal code. The base address of the string is expected in DE. input_char (0xe6) Inputs a single character (blocking) and puts it into the A register. input_string (0x193) Inputs a zero-terminated character string to the location indicated by HL. HL points to the end of the string afterwards. input_stringl (0x1a6) Inputs a zero-terminated character string of max BC characters to the location indicated by HL. HL points to the end of the string afterwards. atoi8u (0x172) Converts the zero-terminated string referenced by HL into a 8 Bit unsigned decimal number stored in A. atohex8u (0x21a) Converts the zero-terminated string referenced by HL into a 8 Bit unsigned hexadecimal number stored in C. The B register contains 0 if the conversion was succesfull or the index of the faulty character. toggle_1 (0x3a5) Switches the first LED. toggle_2 (0x3c1) Switches the second LED. mul8u8u (0x5cd) Unsigned 8 bit multiplication HL=H*L. div8u8u (0x5f6) Unsigned integer division D/E, Quotient in D, Remainder in A. 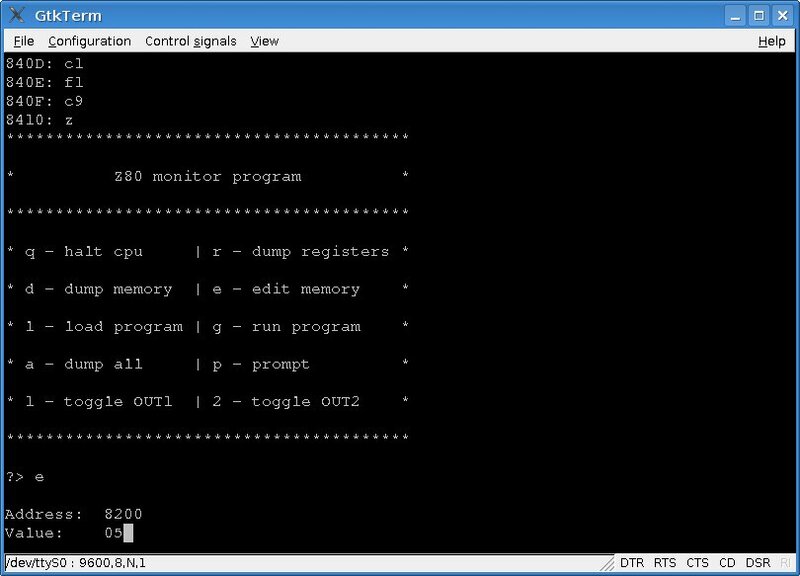 After a reset the computer output a greeting and the main menu (serial communication with 9600 baud, 8N1). 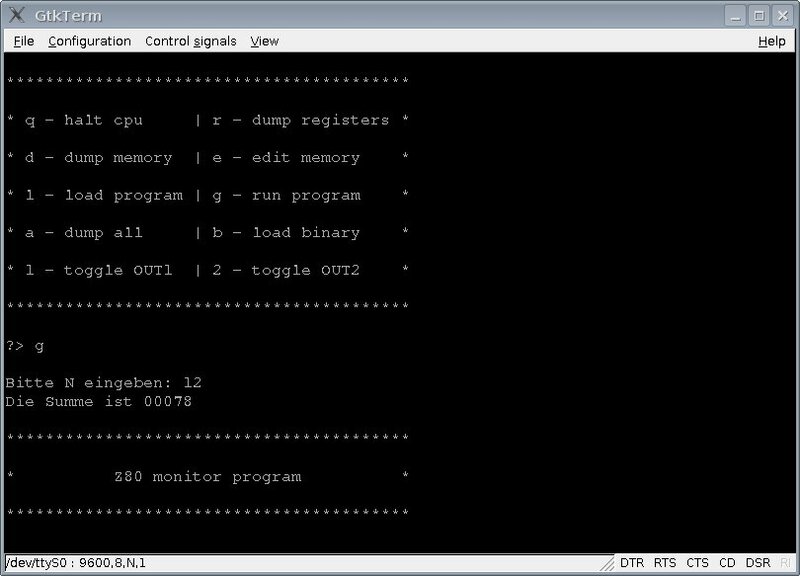 This menu provides functions to dump the memory or registers, load and execute programs or toggle the LED's. The next picture shows a memory dump. Input of the instruction code. Verification of the program loading. Verification of the argument input. The result 0xF=15d is the sum of 1+2+3+4+5 = (5+1)*5/2. 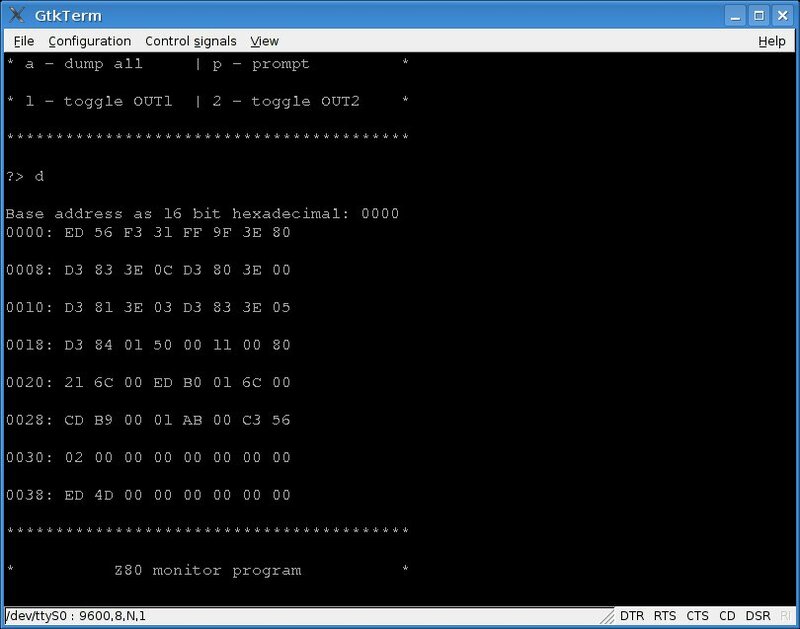 The converted binary Prog2.bin can be send via the "send raw file" command of the terminal program gtkterm.